Yes. The ability to experience pain is critical for survival. Without pain, we might seriously hurt ourselves yet not knowing it. Or we might not realize that we have a medical problem that needs treatment. So pain is our danger signal that calls for our attention. That being the case, what do we make out of it when we take “pain killers” to cut off this signal? Is that the right thing to do? However, chronic pain serves no biological purpose. It tends to go on and on and it is no longer a pain that brings any good for us. In fact, it becomes a serious problem to those who suffer from it. Pain may be sharp or dull. It may come and go, or it may remain constant. We may feel pain in one area of our body, or we may feel pain all over the body. The Chinese is elaborate when describing pain. They say pain can be: aching pain, distending pain, dull pain, empty pain, cold pain, gripping pain, heavy pain, pulling pain, scorching pain, scurrying pain, and stabbing pain. Chronic pain may be due to an ongoing cause, such as cancer or arthritis. Sometimes the cause is unknown with no apparent cause. 1. Transduction – when a certain “noxious stimulus” in a particular part of the body causes the release of chemicals that essentially turn on nerve cells. 2. Transmission – the pain signal is sent to the brain through a number of relay stations in which the signal jumps between the nerve cells in the spinal cord and finally reach the thalamus in the brain. 3. Perception – the brain registers and interprets the pain. 4. Modulation – the brain acts to change the body’s response to pain. In the US, pain affects more Americans than diabetes, heart disease and cancer combined (1). The most commonly-reported pain conditions are lower back pain (27%), followed by severe headache or migraine pain (15%), neck pain (15%) and facial ache or pain (4%). An article in the Wall Street Journal of 11 May 2010 said, “Some 76.5 million Americans, or about 26% of all adults, suffer from chronic pain, generally defined as any pain that lasts more than six months … the conditions can be as debilitating as many severe diseases, leaving the patient exhausted and unable to carry on with many everyday activities. Unless you live with chronic pain, you can’t imagine how it feels. Without adequate treatment, this pain and suffering can be expected to continue throughout life (2). According to the Norwegian Institute of Public Health, chronic pain affects about 30 per cent of the adult Norwegian population. The most common chronic pain conditions are back and neck pain and pain of unknown origin. Other chronic pain conditions include headaches, pains from injuries and surgery, pain associated with cardiovascular disease and with neurological disorders (3). Prevalence of pain increases with age, and women are more susceptible than men. Treating chronic pain be challenging. Often the reason for the pain is not clear. And it may take several types or combinations of treatments before relief is found (4). Dr. Edward Pullen wrote, “Treatment of chronic pain is the scenario that puts me and every practicing primary care physician in a no-win situation regularly (5). Science Daily of 5 June 2008 (6) reported that while various approaches and combinations of therapies to treat pain have advantages and disadvantages, researchers don’t yet know how to determine which is best for individual patients. Among the approaches to pain management studied were those relying on the prescription of opioids (drugs such as morphine), surgery, and alternative medicine (acupuncture, herbal remedies). Matthew J. Bair, assistant professor of medicine at the Indiana University School of Medicine said, “We have found that there are huge gaps in our knowledge base. For example, none of the opioid research trials lasted longer than four months, a small fraction of the time during which many chronic sufferers typically experience pain and are prescribed this potent class of medication”. Many physicians have not been well trained in pain management. Dennis C. Turk, MD, and colleagues from the University of Washington in Seattle said, “Treatment of chronic pain today remains strikingly inadequate …for all the treatment modalities surveyed, only about half of treated patients had a response — and the reduction in pain was only about 30%” (7). In Norway the most common method of managing chronic pain is to use painkillers or analgesic drugs. Both opioids (morphine-like) and paracetamol /acetaminophen (Panadol-like) and NSAIDs (non-steroidal anti-inflammatory drugs) are used. In 2010, around 1 million people are prescribed these drugs (3). Many analgesics are effective for a short time period only. And they carry a risk of habituation and dependency with prolonged use. Some painkillers can cause side effects when used over time. NSAIDs can cause bleeding / stomach ulcers and medication-induced headache (3). Straightforward “single mode” pain treatment usually results in short-term relief at best (8). Multidisciplinary Pain Management is the gold standard when it comes to helping people with chronic pain recover their lives (9). Chronic pains management should take into consideration a broad range of physical, social, psychological, and behavioral issues. Medications, acupuncture, local electrical stimulation, brain stimulation, surgery, psychotherapy, relaxation, biofeedback, and behavior modification may need to be employed to treat chronic pain. What is trigger finger? Trigger finger, trigger thumb, or trigger digit (medically known as stenosing tenosynovitis) is a problem of your finger or thumb getting stuck in a bent position and to straighten it you have to snap or push it up – like pulling and releasing a trigger of a gun. If trigger finger is severe, your finger may become locked in a bent position and is unable to straighten. Symptoms: One of the first symptoms may be soreness or swelling at the finger or thumb. The most common symptom is a painful clicking or snapping when bending or straightening your finger. Trigger finger is more common in women than in men and tends to occur most frequently in people who are between 40 and 60 years of age. Cause: It may be caused by highly repetitive or forceful use of the finger and thumb. The problem arises due to the inflammation of the tendon. Medical conditions like arthritis and diabetes may also give rise to this problem. Medical treatment: The doctor may prescribe anti-inflammatory medications such as ibuprofen or naproxen or may give you steroid injection. If your condition does not respond to these treatments, surgery may be recommended. Case Presentation: Yoke is a 61-year-old female from Kuala Lumpur. She had a problem of trigger finger over the past seven to eight years ago. About three years ago she underwent an operation to correct the problem. The surgery helped her for some months but the problem recurred after that. Yoke came to see us on 31 October 2011. She underwent five sessions of e-therapy and her problem was resolved. Session 1 – Detox #2: She had good sleep. The tightness of her fingers had loosen up. Session 2 – Detox # 3: Her sleep was not good. The tightness in fingers had reduced. Session 3 – Trigger Finger #127: She had less sound sleep. The tightness of her fingers was reduced further. Left hand fingers had returned to normal. Session 4 – Trigger Finger #127: The problems in both hands were almost resolved. Only one finger in her right hand was still tight. Session 5 – Rigger Finger #127: All problems resolved. The “stubborn” finger of her right hand could be straightened without any more pain. She could now open up both hands showing the palms fully. Over the years, I did suffer from trigger finger. In the middle of the night, unintentionally one finger was bent and snapped closed. It would not straighten up. I was awakened by this. I had to massage the base of the finger and then push up the bent finger. Sometimes it worked but sometime it did not because it needed more massaging. The problem persisted for some weeks. I did not do anything but learnt how to live with it. Fortunately the problem went away by itself. It comes back again once a while. My problem became serious sometime in August when we were about to go to USA visiting our children. My thumb became swollen and could not bend. And when it was bent I could not straighten it. Of course it was painful and I had to massage it. Massaging helped a bit but did not cure it. I realized that the cause of this “bad” thumb was due to the over use of my thumb – for years I have been using my right thumb to pry open the lid of the herbal containers in our centre. During August I over used my thumb because I needed to prepare many herbal teas before going for our holiday. Now, I learn not to use my thumb any more for this. Instead, I use the fingers of my right hand to open the container. During our stay in the US for three weeks, I had to endure the pain and discomfort of a trigger thumb. On certain days the thumb became more swollen – probably due to increased inflammation after eating certain food. When I came back from the US, I started to read about trigger finger. I wrote Program #127 (Trigger Finger) for my e-machine and began to use it. After a week, the problem was resolved. Based on this experience, with much confidence, I was able to help the above lady. All treatments were completed in August 2010. A repeat CT scan on 20 November showed no more ascites, but the lymphoma had not totally disappeared. Soon afterwards, Anne suffered swelling of the left side of her face around the jaw. A biopsy was performed. The report on 6 January 2011 indicated recurrence of the non-Hodgkin’s lymphoma. Anne came to see us for the first time on 29 April 2011. After about two months on the herbs, Anne and her husband came back to see us again of 1 July 2011. She benefited from the herbs. During this second visit, Anne underwent a week of e-Therapy in addition to taking the herbs. Her health improved further. Felt much better after two months on the herbs. More energy, walk with more stability, better appetite, slept better – could turn sideways, right or left. Able to bend my knees – before to do so was painful. Heart palpitation still persists. Had eight cycles of chemo. Before chemo no such problem. Felt recurrence of lumps in my body and the lump on my cheek seemed to grow bigger. I also have fevers at times. Doctor asked to undergo radiotherapy and chemotherapy. I declined. Came to CA Care Penang for the second time after two months. The first session of the Therapy done on Friday night. After the Therapy stomach churned for a while, until she fell asleep. Problem gone the next morning. Passed out a lot of urine. Beside these there were no other side effects. Able to sleep better than before. Woke up with more energy. Was able to go to the shopping mall the whole of Saturday. Lump on the cheek felt less tight. The second session of the Therapy done on Sunday night. Woke up the next morning – I felt more fresh. Over all felt much better. On a scale of 10, condition improved to 8. Before the Therapy it was at 3 or 4. The third session of the Therapy was done on Monday morning. The fullness feeling of the abdomen was gone. This feeling arose after chemotherapy. No such problem before chemo. Pain in both sides of temple improved by 50 percent. Slept soundly, unable to sleep well before this . Bowel movements better. No more pain when sweating. Breathing improved. Tense or hardened stomach muscle eased and able to pinch the stomach now. The AcuGraph reading during the first visit, on 29 April 2011 is a below. The picture showed many imbalances. 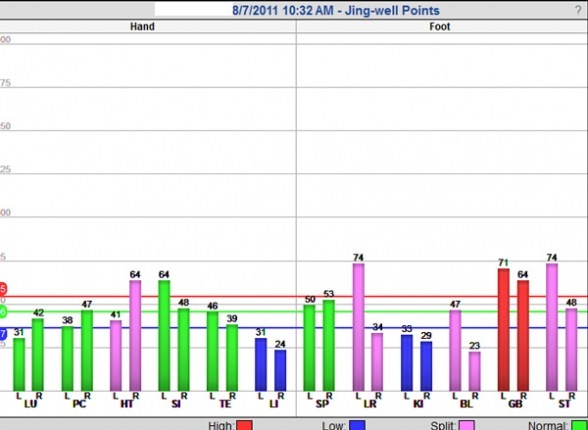 On 8 July 2011, the AcuGraph reading showed tremendous improvements. This was after undergoing a week of the e-Therapy. Anne was ready to go home after this. Ron is a 21-year-old male from Medan, Indonesia. A year ago he met with a motor car accident. While driving one night, he and his four friends drove off the road and fell into a 20-metre-deep ravine. Fortunately no one was seriously injured. Inability to have a good sleep at night. He wakes up two to three times each night for no apparent reason. For the night he sleeps a total of only about five hours. He suffers from pains in the lumbar region and both sides of his shoulder blades. Day 1: Detox # 2 – for 34 minutes After receiving this therapy, he was able to sleep for eight hours without having to wake up. He felt fresh the next morning. Day 2: Detox #3 – for 51 minutes Same as the first day. Uninterrupted sleep for eight hours. Felt fresh the next morning. Day 3: Lumbago # 98 – for 30 minutes No more pain in the lumbar region. Below is our video conversation recorded over the three-day period. Ron is not the only person who slept well after the e-Therapy. There are many others before him who reported similar results. I have been using the therapy for more than a year now. After the 51-minute Detox program I experienced deep, good sleep. The benefit of e-Therapy in promoting good sleep is without doubt. The most important question to ask is: Does e-Therapy produce any adverse side effects? This is the first question we always ask of every person who undergoes the e-Therapy at our centre – Do you encounter any problem after receiving the therapy? No one has so far encountered any adverse reaction, provided of course they follow our instruction to drink plenty of water after the treatment. As said earlier, I have been using the Detox program for more than a year and I too did not suffer any adverse side effects. In fact one of the positive side effects is that my hair has turned darker from the usual silvery gray! Using the e-Therapy is cheap and does not come with adverse side effects like the sleeping pills. Ron is a 21-year-old male from Medan, Indonesia. A year ago he met with a motor car accident. While driving his car at night with four friends he drove off the road and fell into a 20-metre-deep ravine. Fortunately no one was seriously injured. Since then he suffer pains in his lower back and on both sides of his shoulder blades. I must say I am an “expert” in figuring what to do when you have lower back pain. When I was in my mid-40s (i.e. about two and a half decades ago) I had my first episode of lower back pain. My daughter came running to me one morning to say good bye before I were to go off to work. I picked her up and sprained my back very badly. I was in severe pain and was unable to move. I summoned an ambulance to bring me to a nearby hospital. I was hospitalized for a few days. But the doctor did virtually nothing. Worse still, I had to sleep on a soft hospital bed that aggravated my backache. Of course with regular painkiller intake, my problem improved. I was discharged from the hospital but was not totally “cured”. My feet felt numb and I could not feel the carpet under my feet when I walked over it. It was then that I learned that modern medicine could not effectively handle the problem of lower back pain. Painkiller, muscle relaxants, steroids, etc. are not the answers. On hindsight, I must say I was lucky that the doctor did not do anything. Had he suggested surgery, I would have agreed to it! I started to learn tai qi because gentle exercise is supposed to help. But every time I bent down, I felt the pulling pain of my stomach and back muscles. Anyway, I had to learn to live with this discomfort. After all, the doctor had done his best and at that time I knew nothing about alternative medicine. I was, like most English-educated people, an ardent believer of modern, scientific medicine. Remember, I was then an academic and a scientist in a science university. Something as “hocus pocus” as alternative medicine was never my cup of tea. Living a life with back pain was no fun – rather frustrating! I was introduced to a Chinesesinseh who put some acupuncture needles into me. He also massaged my strained back. The massage caused such severe pain that even my urine would leak out! But I was assured that this was the way it is – fight pain with pain! All said, this Chinese sinseh’s method did not help me. Some months later, my wife and I attended a talk by a direct selling agency. This meeting was held in a big hall where many hundreds of people attended. The speaker talked about a certain bio-frequency lamp invented by someone in China. It was supposed to “cure” various ailments, including lower back pain, slipped disc, etc. This lamp was priced at over RM 3,000 each. I bought the lamp and used it diligently. Within a week my condition improved. With such positive effects, I started to share the lamp with people who needed help with back pain. One good case to relate is about the mother of one of my students. She was scheduled to have an operation for her back pain. I advised her to defer the surgery and use the lamp instead. She was “cured” and did not need any more surgery. There was a man in a small town near Ipoh, Perak. He developed a backache wine which was very effective. A bottle sold for RM 150.00. When I felt my back aching, I just need to take a tablespoon of the wine mixed with plain water. The problem would go away. Knowing that this “wine” is so important to me and people like me, I offered to “buy” the formula of the medication. I was told through the relative of the wine man that he agreed to my proposal. Unfortunately the man died just as the deal was about to go through! After the man died, the son claimed that the family had burnt his father’s formula! The world has lost yet another great potential contribution! From the wine, I turned to a chiropractor for help. But with the “sound” of the joints and bone “cracking” when the chiropractor turned and twisted the limbs, the treatment seemed scary. But the chiropractor that I went to was good. I obtained immediately relief after his treatment. I visited him a few times over a period of years. There does not seem to be a permanent cure for lower back pain. The problem keeps recurring. Sitting on the “wrong” chair or sleeping on the “wrong” bed brings back the problem almost immediately. Picking up some heavy books or carrying a heavy bag while on a tour can also invite the problem. So, I have learned to live with the problem and try to avoid the triggers. Unfortunately, I still do suffer from lower back pain off and on up to this day. Even sitting too long in front of the computer plus “bad” sitting posture can cause severe back pain. I just suffered another episode of back pain about a week ago. 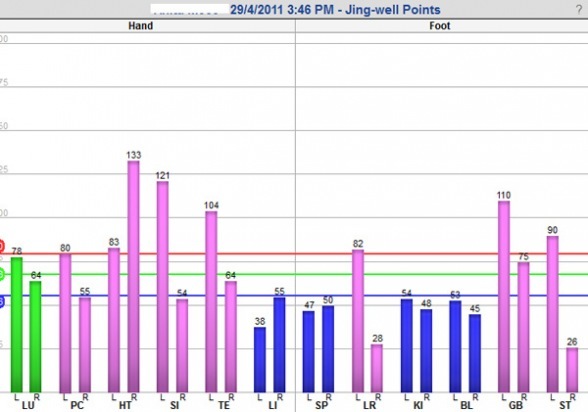 I did the e-Therapy and used the Pain Solution which I had over time developed for this problem. Since early 2010, I used the e-Therapy. I find it helps me tremendously. I do not need to go to the chiropractor or drink the backache wine any more. I have learned to help myself just as in the case of Ron documented here.